I partnered with Mannington and Nebraska Furniture Mart on this project. Although I was not compensated, a portion of the product and installation costs were provided to me. This post also contains some affiliate links. As always, all thoughts and opinions are my own. 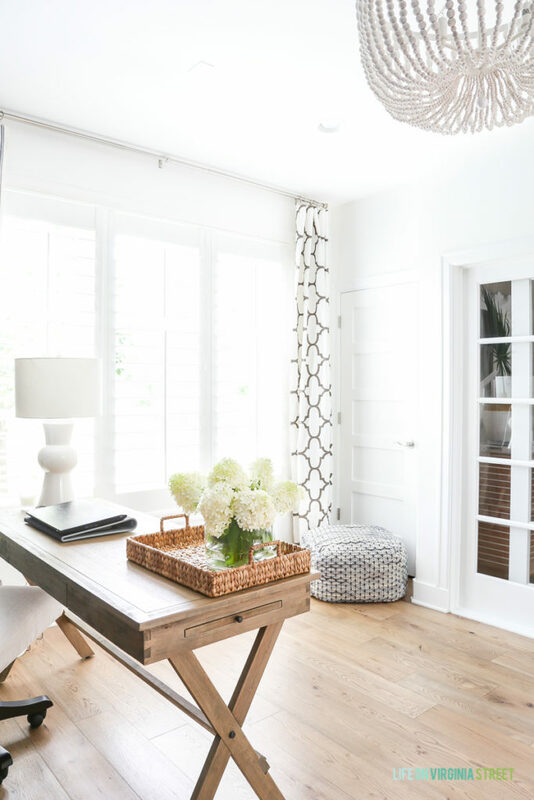 If you missed yesterday’s post, I shared all the past makeovers in our home office, along with all the details on our flooring selection. Today, I’ll be sharing all the fun photos of how the space looks now. Now, without further delay, I present our updated office with Mannington’s gorgeous White Oak 7″ Maison Normandy hardwoods in the Bistro color. 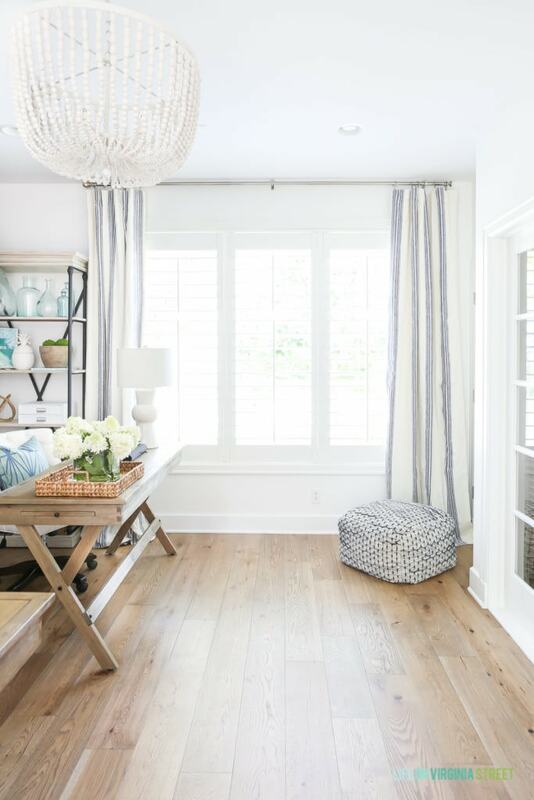 I think you’ll agree the hardwood is the absolute perfect tone for the beachy vibe we love so much! The tone is warmer than many other samples I looked at (that tended to be more gray) and is the perfect reminder of warm sand on the beach. This was almost the exact view just shortly after we moved in. Can you believe the difference?! I think literally the only thing that is the same is the curtain rod. One thing I’ll note: I’m still deciding on curtains so half the room has the old pattern and the other half has a new pair of striped drapes. Let me know as you look through the updates which version you like better. I’m still undecided! I have an idea on where to use the old ones if I decide to go with the stripes. Another side note: I have a list of all the sources at the end of the post if you don’t see items listed along the way. The floors have been installed for nearly five weeks, and it was apparently rather quickly that we needed to swap out our old office chairs for ones with rollers. We’ve had these linen rolling chairs for about a week and couldn’t be happier with them. It’s actually pretty fun to roll around on them too 😉 One thing we absolutely love about the matte finish and the lighter color is that cat hair doesn’t show up at all. The difference is night and day compared to our dark hardwood floors. We pulled the desks out a little further into the room to accommodate the new bookcases. Unfortunately, that makes it nearly impossible for me to take a decent wide-angle shot of the full room. I’ll share more on the functionality of the bookcases later this week, but I love that they store all our essentials but still allow space for me to decorate. It’s definitely been an adjustment learning how to best make this space work for two people, but I think we’re getting there! 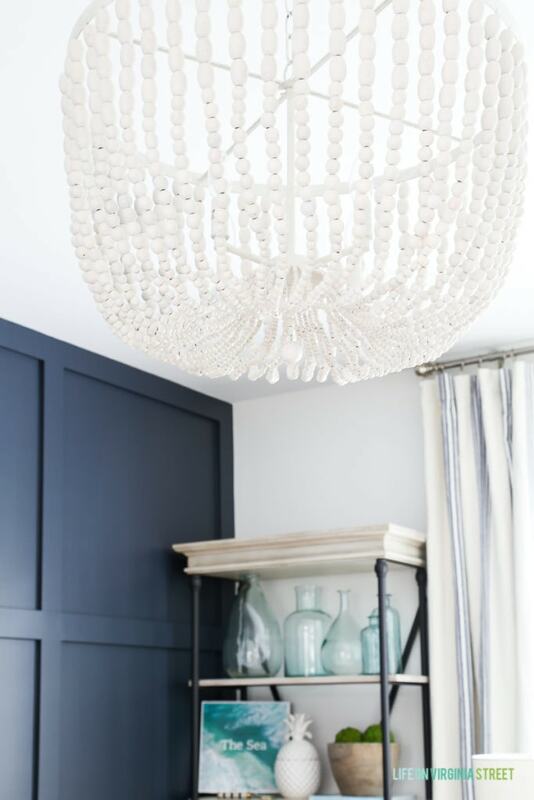 The new whitewashed wood bead chandelier is one of my favorite new elements in the room! It’s definitely a statement maker, but because of the whitewash, it also doesn’t overwhelm the space. Here’s a full shot of the floors from the side of the room. You can also see the different curtain panels here. I think the graphic trellis print looks really good in that all-white corner, but it almost feels too busy when it’s next to the bookshelves. One of the reasons I tested the striped panels is because they have blackout lining and there are times throughout the day the sun is coming in so strong on my side I can’t see the computer (even with those old panels). So I like the idea of the blackout functionality. And here’s the same angle with matching curtain panels. And if you’re wondering why that pouf is even there, it’s for the cats. They are obsessed with it and love to sleep on it and/or watch birds and cars out the front window. It’s a lot easier to move than the chair that was there previously, which makes closet access that much easier too. You may also notice that as part of this makeover, in addition to all the painting I did, we also replaced the outlets and plates to all white. It’s somewhat ridiculous how excited I get over little things like this. 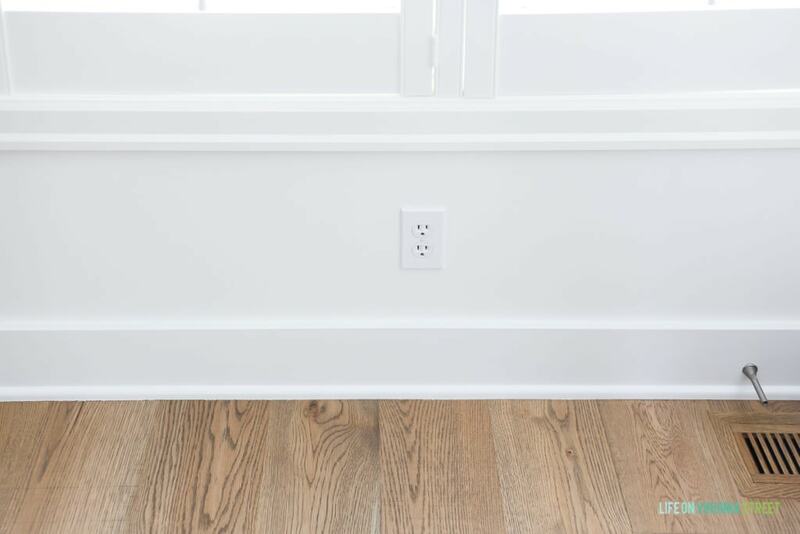 The custom vents were obviously the way to go and look so perfect with the floors! These were ordered through Nebraska Furniture Mart, and they have a third party vendor that custom makes each one to match your floors. The installers from Nebraska Furniture Mart did an AMAZING job with the transition between the two sets of floors. Thankfully each type of oak was within 1/8″ width of one another. They knew I really did not want a transition strip (one of those rounded mounds that goes on the floor between the two sets) so they worked to slightly build up one side, all while making sure it wouldn’t squeak. I couldn’t be happier with the job they did! The view from my desk looks out onto our recently updated entryway. I love how the two spaces tie together so well now! I feel like the striped rug also helps transition the look of the two tones of wood. I also can’t get enough of our trims and doors all painted white now. I think the banister may be my next target, although the thought completely terrifies me. It’s safe to say, we’re majorly in love with our new floors! 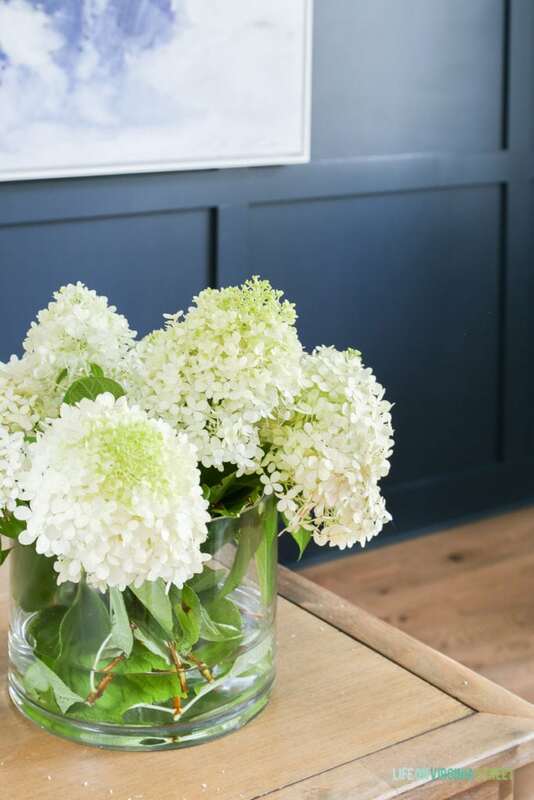 And sadly, I now want white walls and white oak flooring throughout our entire home! Since this post got rather long, I plan to do a follow-up post on Thursday with details on the functionality of the updated space. I hope you love our new office (and floors!) as much as we do! 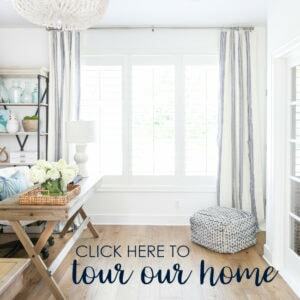 Thank you so much to Mannington and Nebraska Furniture Mart for partnering with me on such a fun project! The floors are beyond anything we could have ever hoped for! Love the new look! I would go with the striped curtains though especially if they are black out ones. Be careful with the rolling chairs they WILL scratch the floors (ask me how I know). We had to put the protectors on the floor. Don’t like them but tiny particles of sand were getting on the rollers and leaving lots of scratches. Though I am a fan of stripes this time I prefer the lattice design. The stripes are a little underwhelming, to me. The room looks really good. Looks lovely! I would second the fact that roller chairs will scratch the floors! We haven’t put pads down because they are big and ugly, but just know they will scratch! Love the stripped curtains as well. Sooo gorgeous, Sarah! Those floors are so perfect. And those striped curtains are so you. I love the subtle coastal vibe. I think between the navy wall and your fabulous chandelier you have a beach vibe going. So I think the stripe drapes would be best. And the functionality of them having the blackout lining makes them perfect. 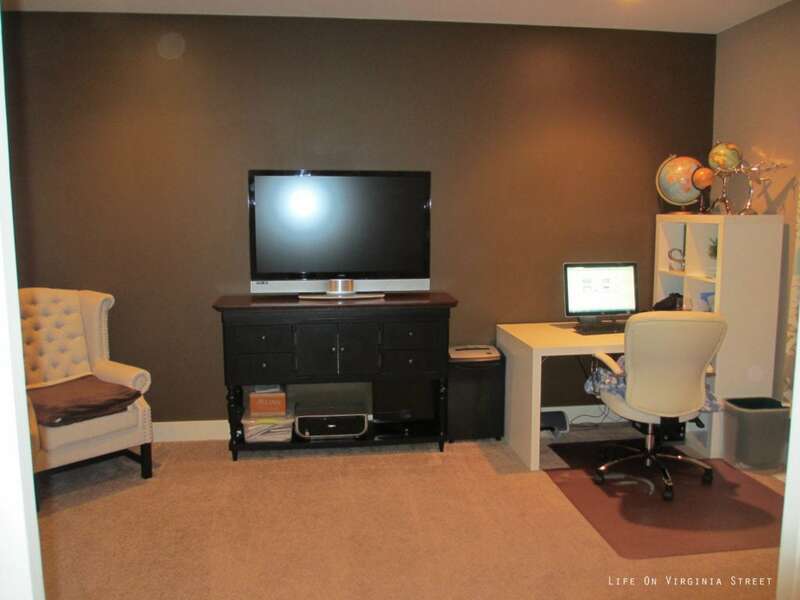 John & Sherry from YHL mentioned once that their rolling desk chairs scratched their floors. So the had to put protective mats under them. If you don’t like the look of those maybe you could do a pretty rug. Your “new” office looks so good! I’m jealous of your white walls. Sadly my little place doesn’t get enough sunlight to pull them off. Oh Sarah….. it’s gorgeous! The desks look great with the floors…..(I wondered how that would work) Floors are beautiful. 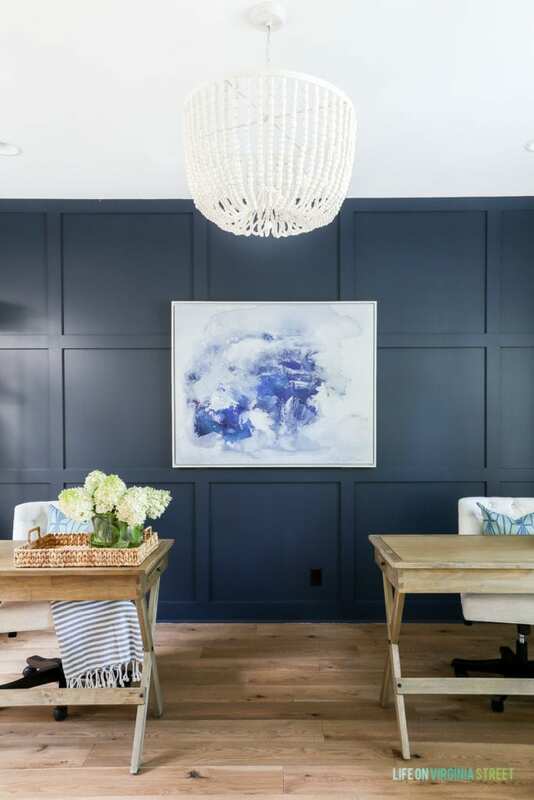 Love all the white on the walls… but I do still love the blue accent wall with them. I prefer the new stripped curtains … less busy. The whole room is calming. (What an office should be) ???? Great job, you nailed it! Love your new office space Sarah. Love your new floors, bookcase and chandeliers. 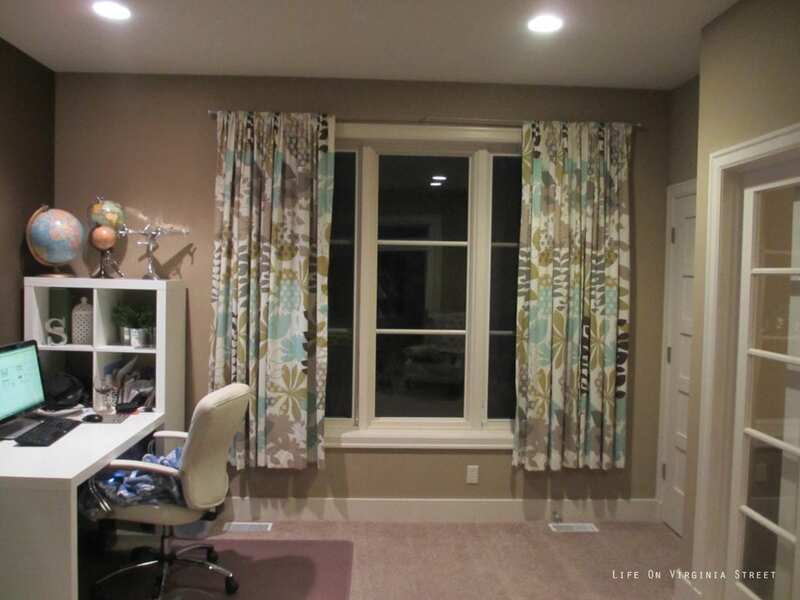 As for the curtains, they are both lovely but I think I favor the patterned one a wee bit more just b/c it’s a pop of unexpected pattern and gives the space an interesting look. I LOVE it, Sarah!! The flooring is perfect! And I’m filing away all of my favorite floors for when we re-do our flooring in our whole house, and this one is definitely going in the file. Oh, and love the striped curtains! Definitely keep those up. (But I need to know where to find the old curtains, because they look a lot like the ones I stenciled for my living room and people ask me about them ALL the time, but don’t want to make them, so I need to know where to point them.) Have a great day!! I can’t believe how much bigger the space looks than in the “befores”! That flooring is perfection. And I vote for the striped curtains. 🙂 Hope you’re having a wonderful week, Sarah! Striped curtains all the way! 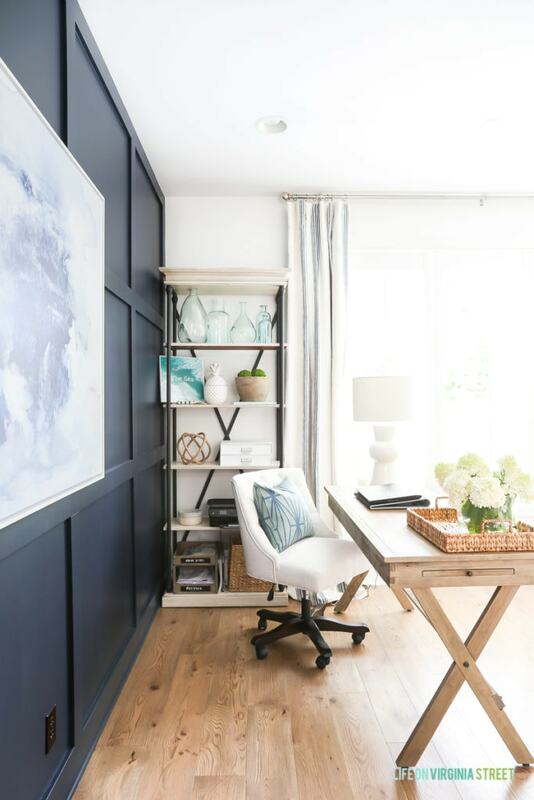 Sarah: I know you were thinking about swapping out the desks, but they are the perfect transition as the eye goes from the floor to the dark blue wall. Keep them! Also, I’m liking the trellis curtains in this space. The whole room looks amazing and I thought it did a year ago—it just got better! Your office room looks amazing! I love your floor choice. I have had dark wood floors myself and they take a lot of maintenance to stay looking good all the time. I think the transition from one hardwood to another looks great and those floor registers are perfection! Money well spent. For this space I would stay with the Trellis drapes. They just seem to flow with the room better! You have done a great job! Trellis print curtains for sure! Much more dramatic. Add some interest to the room. Looks awesome!!!!! Great job!! I’m loving the striped curtains for the whole relaxed vibe ???? 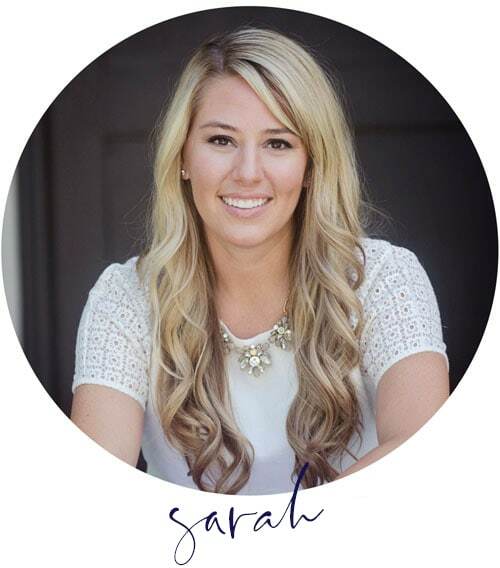 I can’t get over the transformation of this space, Sarah! 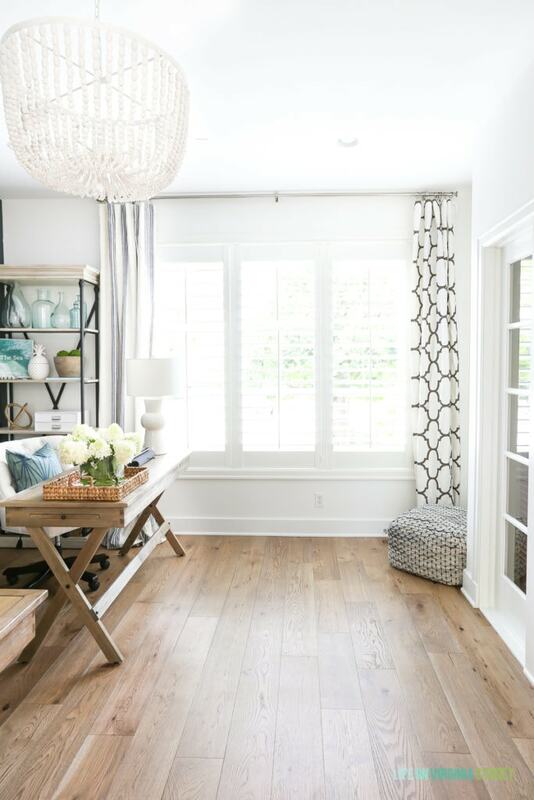 The floors are so absolutely perfect – I love the beachy vibe that color gives. My vote for the drapes has to be the stripes – LOVE! Seriously, friend – your office space looks incredible! Your office looks beautiful. We are moving into a new home soon and I thinking I want most of the home to have grays and blues for colors so seeing your transformations is great. But I am a photographer so my office has lots of computers and gear with wires etc even with some equipment being wireless and bluetooth. So, where did you hide the wires or did you just take the photos from an angle where we couldn’t see them? I don’t feel like I could ever have my desks facing anywhere but a wall so the wires aren’t all seen. I woul dlove to not have to face a wall. Any suggestions or ideas would be great! Thank you. While I love the old curtains against the white wall and door, I think the striped goes with the Beachy vibe. PS OBSESSED with the way this turned out! Love the floors and I love that desk. Been looking for something that size. Also, I would go with the stripe curtains. I see your dilemma….I can’t decide between the striped and trellis drapes! Consider the glass floor mats instead of plastic. The room is awesome, great job! A beautiful space.! But I can’t help but think maybe the bookcases should flank the artwork. Even though the wall treatment is gorgeous, it seems it would add symmetry, depth. and balance.? Love the floor! This is beautiful!!!!! Love so many things about it, especially those STRIPE curtains!! Oh my gosh, Sarah!! What a huge difference those floors make! ! They are just stunning! Ahhh! It looks SO GOOD! I love the wall color combos with the flooring. And I love the striped curtains! This makeover is amazing. 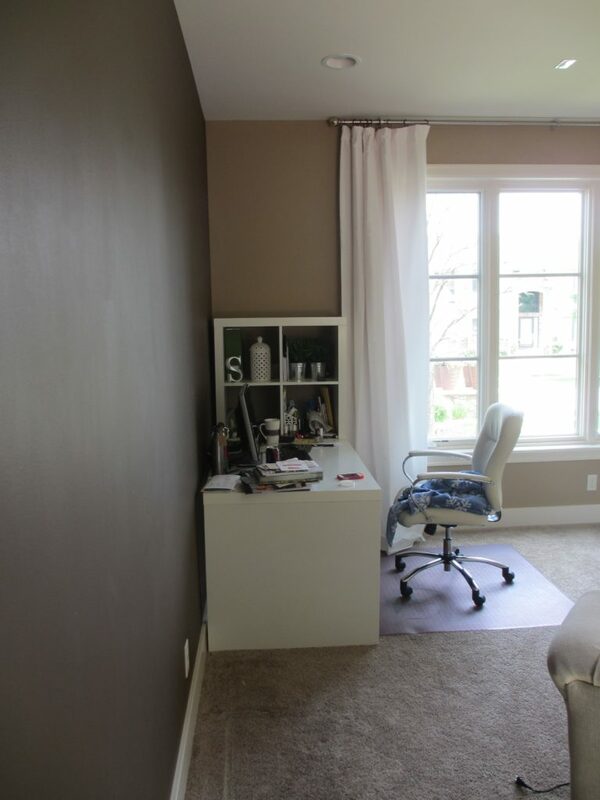 All the bright white painting you did really pays off for a beautiful, happy room. I definitely would keep the trellis curtains, the graphic design pops next to the bright white so much more than the more muted stripes. 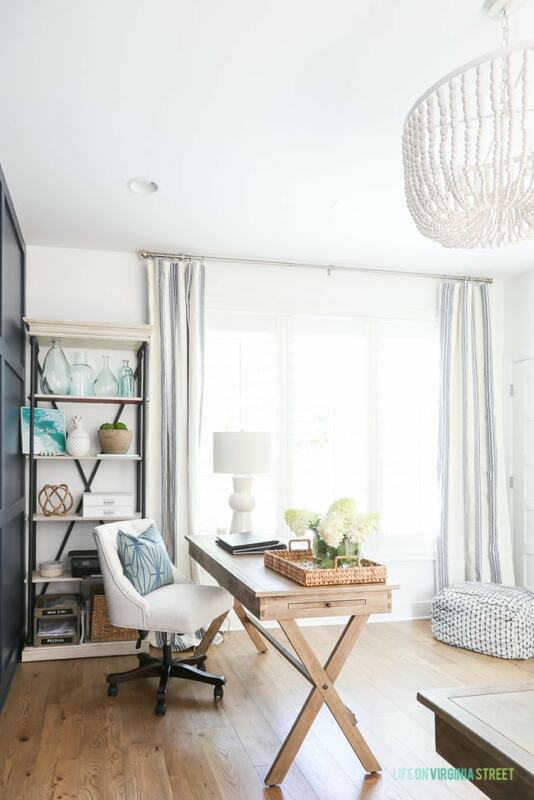 I like the stripes for that space- definitely goes with your beachy vibe and looks better next to the bookshelf. Beautiful room! What a lovely transformation! I vote for the striped curtains, they are classic and timeless, while the trellis pattern has become overused and commonplace. Enjoy your new, inspired office space. Beautifully done! I vote for the striped curtains. The desks would bother me being so close to the floor color. Maybe you could paint them? Floors are beautiful. It was interesting to see different wood tones next to each other. I was thinking you’d have to go tile, but I think it works. Great space! Totally amazing, Sarah! I love the look of the floors! They really brighten up the space even though it wasn’t dark to begin with. And I vote trellis. It’s just a fave pattern of mine. Beautiful Office – mine needs a serious update and you have inspired me to quit procrastinating and just get it done! I like the curtains – everyone and their brother has the other curtain design. I totally get the blackout curtains – especially since cold weather is a few months away – when it’s below zero in Omaha, the extra lining can keep the room warmer as well. On a practical side – where do you plug everything in that you would need on the desks – do you have a trick for hiding all the cords? It looks beautiful Sarah! 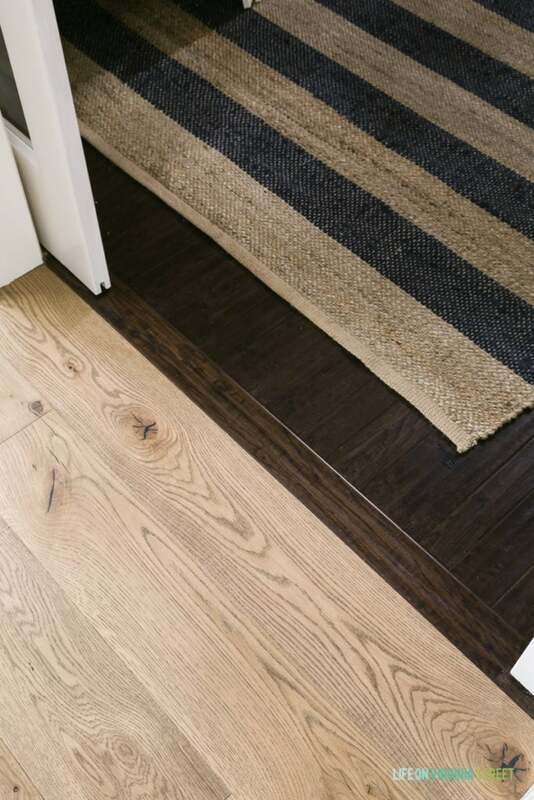 And I agree… the entryway rug works brilliantly to blend the two spaces! It looks incredible Sarah! 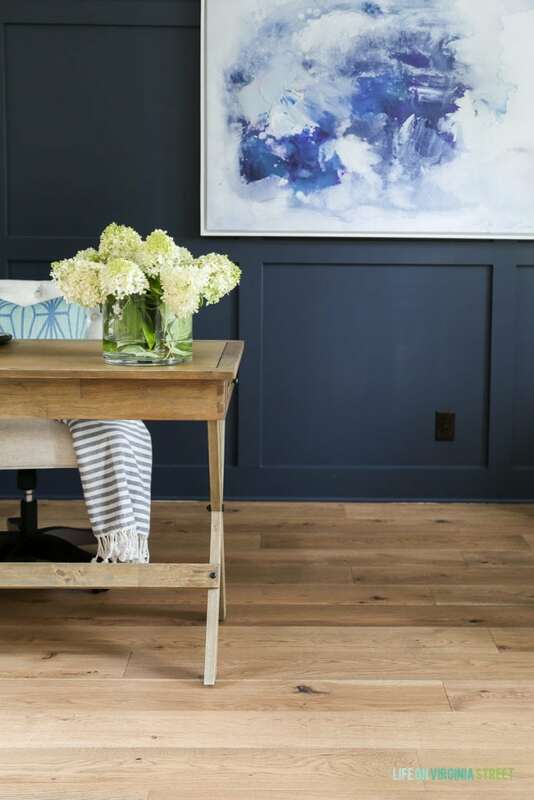 I love those floors – that’s exactly what I would pick to install throughout our house. So perfect!! So many great things about this space. I like the desks with the floor and I think anything else would draw the eye too much and just be too many things in the room. For that reason I’d also choose the stripe curtains. 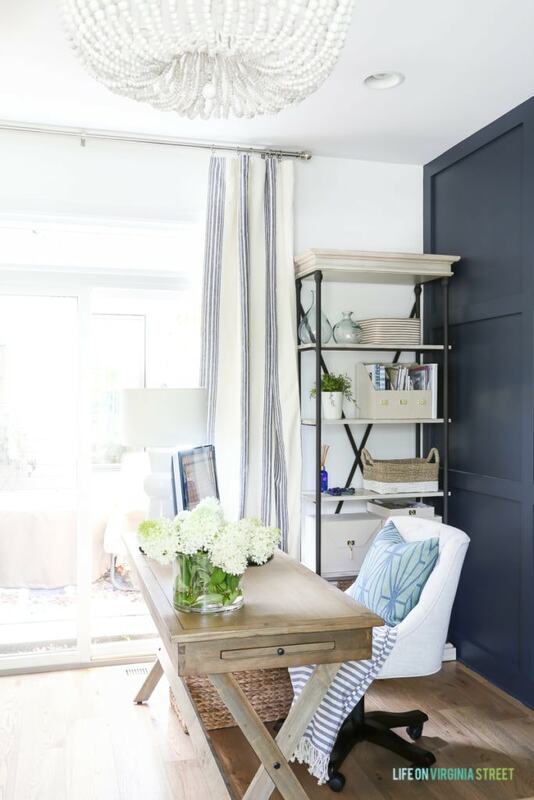 I love the blue wall and with the stripe curtains that links well with the hallway. The floor registers were worth the money to have them disappear. Such a great space! The striped drapes. They are perfect for your coastal theme; they are understated, classy, timeless. The lattice ones while pretty I’m sorry to say were trendy and that trend was over 2 years ago. They are also super busy next to the etagere. love everything, especially the cat pouf!! mine loves to lay on poufs too! the stripe curtains have my vote. as soon as i saw them i recognized them, we have them in out master!! i have been so pleased with the look and the blackout lining. Sarah, you brighten my world watching what you do! I agree with TL about turning the bookcases onto the blue wall. I think it would make the window walls feel more airy. I vote for the stripped drapes!! Do you have any idea on who makes the office glass doors? I don’t. We are the second owners, and unfortunately I think they were a custom build. The room look so great! But I think the banisters need to stay! THey are super unique and so gorgeous with sleek modern lines! They should totally stay! Such a beautiful space! Quick question about your light fixture as i’m currently looking at that same one from world market – did you like it (why did you choose to swap it out) and did it give off enough light? Thanks so much! It’s one of my favorite fixtures ever! We have the larger version which has four bulbs so it definitely puts out enough light in this space. I hope that helps! I love the whole look of your room! The striped curtains look amazing! These floors look SO good! They definitely have a bechy and informal vibe that looks SO good in your office! Love them!! !